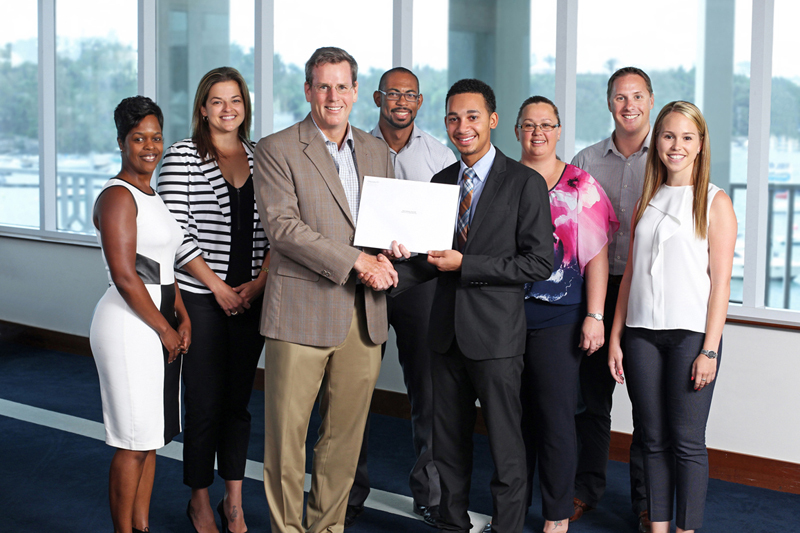 Bermuda-headquartered reinsurer RenaissanceRe announced that Ryan Robinson Perinchief, a triple honours graduate of the Berkeley Institute and resident of Pembroke, has been awarded the 2015 RenaissanceRe Undergraduate Scholarship. This is the ninth annual award, which is valued at $25,000 per year for up to four years. Ryan will be attending Durham University in the United Kingdom studying towards a Law degree. Pictured left to right are: Nicole Belboda-Smith, Lauren Mahoney, RenaissanceRe President & CEO Kevin O’Donnell, Calvin Thomas, 2015 RenaissanceRe Undergraduate Scholarship Recipient Ryan Robinson Perinchief, Lori Symonds, Stephen Troake and Melissa Martin. Ryan has held numerous leadership roles, including that of Head Boy, Student Council Treasurer, Peer Mediator, and Student Advisory Leader at The Berkeley Institute, and as Youth Premier in Bermuda’s Youth Parliament. He has also earned various leadership honors, including the Outstanding Teen Award and a Gold Community Service Award for his involvement with organizations such as the St. John Ambulance Brigade, Center for Talented Youth, National Debate Team, and Bermuda Youth Association. He recently returned from Brazil, where he lived as part of the Rotary Youth Exchange Program. “I’m thrilled to be the 2015 recipient of the RenaissanceRe Undergraduate Scholarship,” said Ryan Robinson Perinchief. “It’s an honour to be recognized by RenaissanceRe, and I look forward to continuing my studies in the UK. The recipient of the RenaissanceRe Scholarship is selected by a committee from across the organization. Criteria for selection include academic excellence, demonstrated leadership experience, and community engagement and service. For more information, visit renre.com. Congrats Ryan! You are an example for the youth and in some cases the adults can learn from you as well!! Take the world by storm mate. Discipline truly has its own rewards! Your family and friends are very happy for you. Keep up the good work Ryan! Public school kid. He is wonderful. Get it done Ryan! Respice Finem! Keep the end in view!